March 2013 has been a busy month with both Amanda & me getting into the full swing of work. With that, I have not had much of an opportunity for any updated blog posts, and frankly this winter has been very long, so we have not taken any trips. But, Amanda had gone back to the States on business, and I had Good Friday off from work. 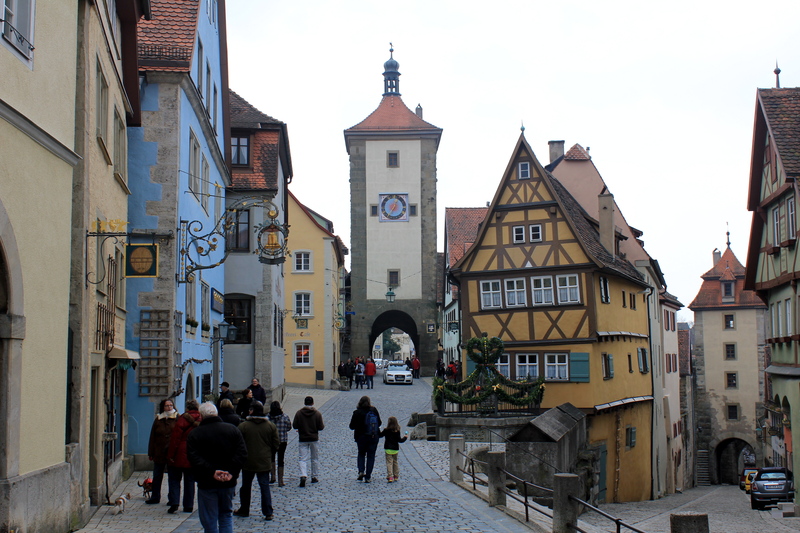 The weather was nice, so I decided to take a road trip to “Rothenburg ob der Tauber” in Germany. Many towns have the same name in Germany. To distinguish what town, or where the town is located, usually what river the town is located on is in the town’s name. 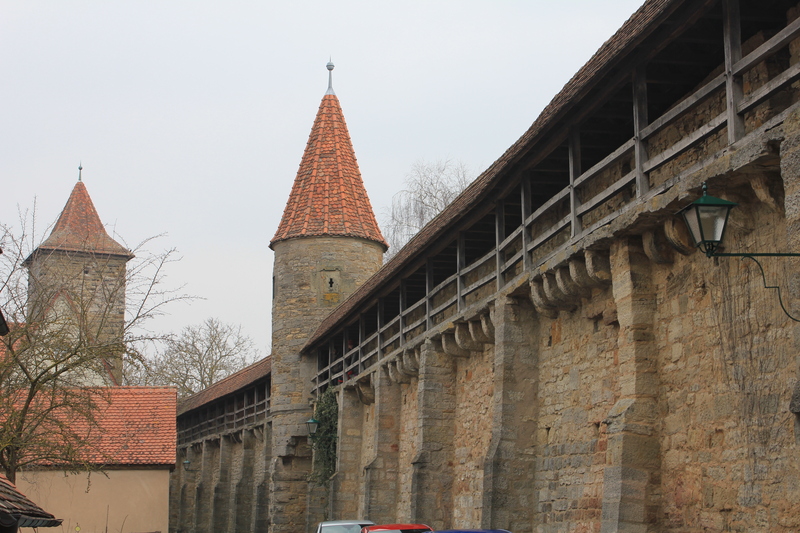 Hence, Rothenburg ob der Tauber means “Red Fortress above the Tauber (River)”. Rothenburg is a very popular tourist town, situated almost halfway between Mannheim & Nuremberg, Germany just across the state border of Bavaria. Why is it such a popular tourist destination? St. James’s Lutheran Church. 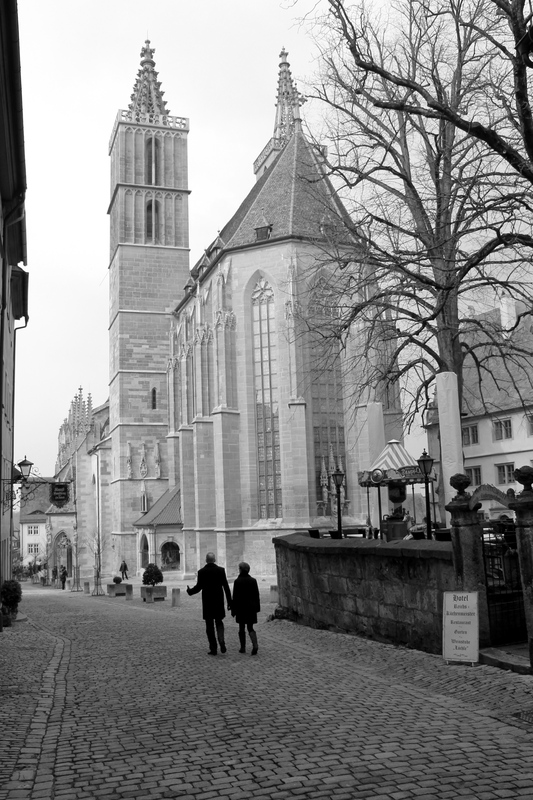 Built between 1311-1484. Inside is a relic that reports to contain blood droplets from Jesus Christ, and has become a pilgrimage site. 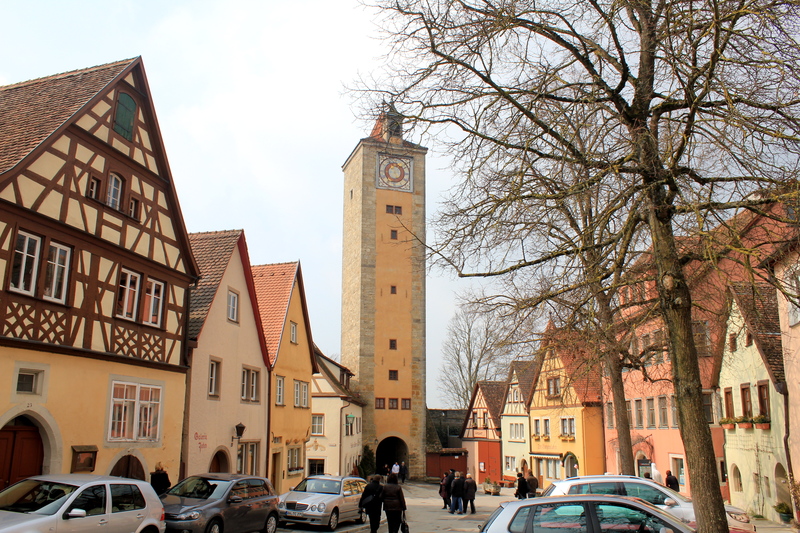 When people outside of Germany think of what does the stereotypical Germany look like, the description fits this village perfectly: cobblestone streets, timber frame houses, medieval walls, etc. 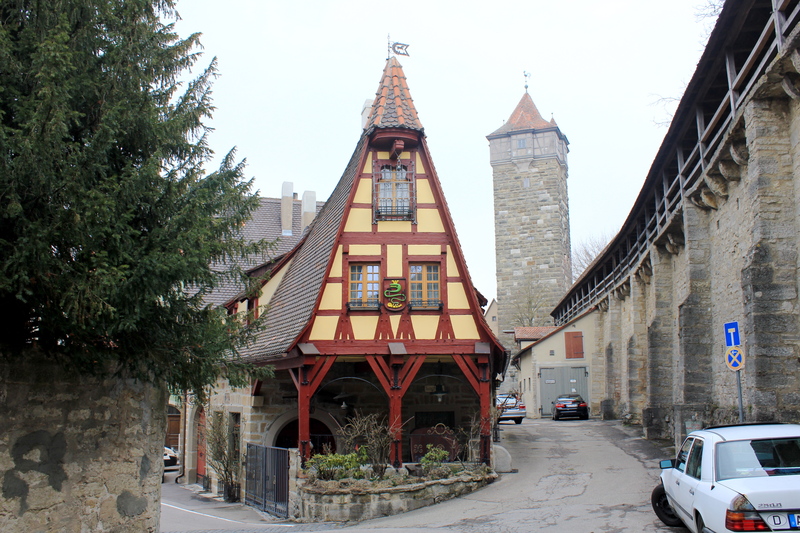 There are many towns like this, but what is unique about Rothenburg is that it is isolated from other towns, is off the main highway, therefore, you do feel like you are being transported back in time. People still work and live in the village, which I would imagine the homes have been in the families for dozens of generations. Above the walls were the ramparts where soldiers and watchmen would defend or be on the lookout for the town. I learned that as a result of the Thirty Years War (fought between the Protestants & Catholics) and the deaths of the Black Plaque, that during the 17th Century no additional growth of the town occurred. 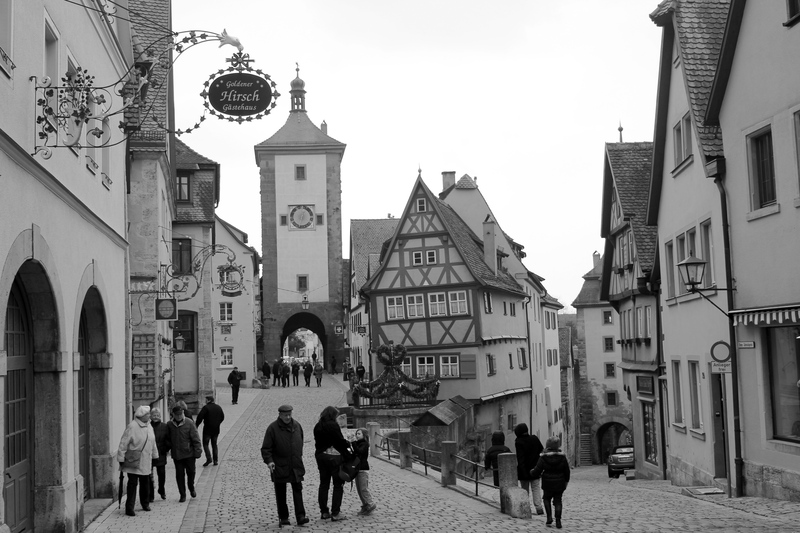 As a result, Rothenburg is stuck in time. During the following years, the area was preserved and pride was taken in keeping the architecture in tact inside the walls of the town. 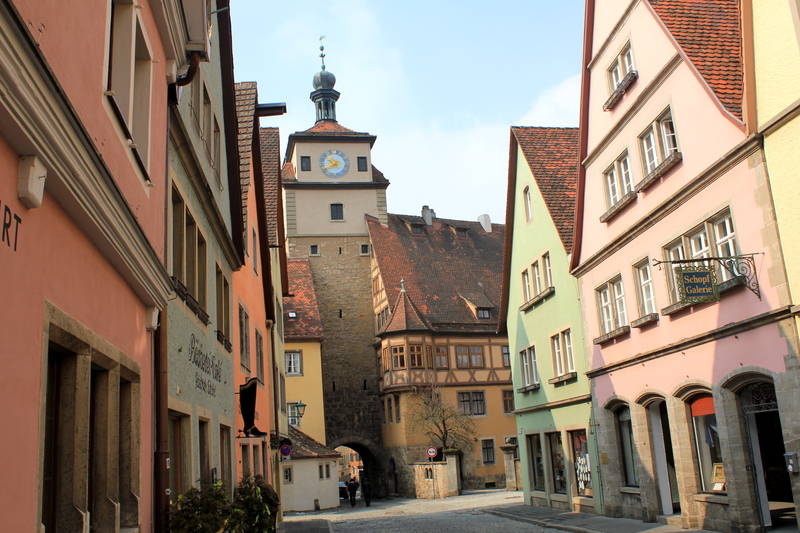 During Word War II, Rothenburg became a symbol of pride of the Third Reich in their history, and as such given the walled fortress around the village, became a stronghold in northern Bavaria during the war. However, bombing campaigns did destroy about 30 of the original buildings, and the village eventually fell to the Allies. So, given this history, I was very excited to see the old buildings, the walled town, and experience the atmosphere of an area trapped in time. It took me about 90 minutes to get there from our apartment. In my trip on the A6 autobahn, I set my personal land speed record of 200 kilometers per hour (125mph), and the BMW handles so well at that speed. The car still had snow tires on, so that restricted me from going no more than 210, even though the speedometer goes up to 260 (160mph)! I spent about 3 hours walking around the town, taking many pictures, before heading home. Below are some of the pictures taken, and if we are friends on Facebook, check out the larger album there. There is plenty of parking around the wall structure, and it only costs 5 Euro for the whole day. Around the wall are maybe 4 to 5 entrances to the center part of the old town. The entrance ways are large arch openings in the wall, just big enough to fit one car. Cars are allowed inside the gate, but only if you have a reservation to one of the small hotels there. Outside the walled area looking over the Tauber River Valley. I chose to visit on a holiday (Good Friday), which meant it would not be as crowded. However, the downside was most of the shops were closed, so you could not go inside. 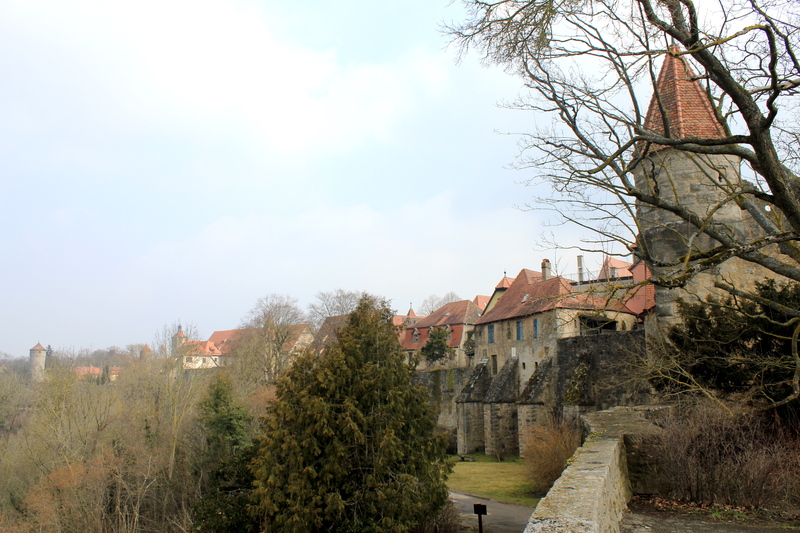 MY RECOMMENDATION: I would definitely recommend a day trip to Rothenburg to see the beautiful buildings and to get a feel of what living in the Middle Ages must have felt (or least looked) like. Get there early (between 9-10am) to find the best parking. There is also a ‘Nightwatchman Tour’ where someone dressed in a medieval Nightwatchman’s uniform will guide you through the town at night. I left before then, but can only imagine how awesome that must be in the evening! Previous: Previous post: Frohe Ostern…Happy Easter! How Does Germany Celebrate Easter?